Determine which kind of pressure washer you need – an electric pressure washer is great for one-story homes while a gas-powered pressure washer is great for two-story homes. After that, decide whether you’re going to buy or rent your pressure washer. Next, read the instructions for how to load your pressure washer detergent into your pressure washer. After that, familiarize yourself with the settings and spray patterns of your pressure washer. Once your pressure washer is set up, secure your eye protection and hearing protection (usually only needed with gas-powered pressure washers). Position your ladder (if needed) so that it’s sturdy against your home. 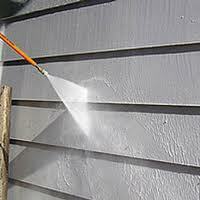 Next, beginning at the top of your siding, turn your pressure washer on and aim it straight ahead. Move the pressure washer slowly from one end of your siding to the other, making sure to keep it at least a couple feet away from your siding to prevent damaging the area. After that, step down and repeat the process on the section of siding below the first. Note: It’s better to work from top to bottom for two reasons: dirt and dirty water will run downwards and if you work bottom to top, you’ll have already washed the areas that receive the run-off; working top to bottom also helps keep you from spraying water up underneath your siding pieces. Keep going until you’ve reached the bottom of your home. Rinse the area around your home with clean water to remove any detergent residue. After that, follow the instructions for how to clean your pressure washer.